When I founded the non-profit Evergreen Athletic Fund at the end of 2008, I had a big vision for what the organization could do. But after the first year, I realized things make take a while to get off the ground. We hosted a few clinics and competitions, but the donations trickled in very slowly. This past year, however, saw the organization finally grow into what I envisioned. Below are some highlights of the year in each of our areas of focus. When I wrote about my training last month, things were going quite well. Distances were at an all time best, but my technique was mediocre. This month has seen the reverse. My results have declined, but my technique is progressing. 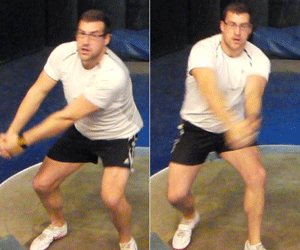 This reversal often happens in my training and is one of the many paradoxes in the hammer throw. You would think that my best results would occur when I had the best technique, but it doesn’t always work that way. This time the cause of the apparent paradox is the intense special-strength oriented training program I began in November. I would complain about the crazy amount of volume, but I think Kibwé‘s new program has me beat. Nevertheless, my energy level has plummeted and my results have slowly gone with it. It’s been two and a half years since I started writing about my training on this thing called the interweb. Since then, many other track and field athletes have also started their own websites. Now, there are so many blogs that it can be hard to decide which ones are worth the read. Some are updated often and some rarely. Some provide a superficial look at the athlete, while others are more personal or contain detailed accounts of training. Below is a collection of my favorite sites across all the events. If I leave out any great blogs, feel free to add them in the comments below. I’ve always thought that the best tool for sports psychology is a good training program. A good training program won’t solve all of an athlete’s problems, but when training is going well, it is hard to convince an athlete that they will not succeed. Throwers even have a unique advantage in this department. We get to practice every day like it’s a competition and are truly able know what shape we are in; all we have to do is pull out the tape measure and measure our results. Distance runners, on the other hand, do not have this advantage. An article in last month’s Runner’s World talked about how Kara Goucher has worked with a sports psychologist to overcome her mental hurdles. Unlike throwers, it is harder for runners to know exactly what shape they are in. They obviously run in practice, but they don’t replicate an entire race at competitive speeds. Even if they do, they cannot replicate race tactics in training. When the distance runner toes the line, they often aren’t quite sure what to expect and that is where doubt can enter the mind. The indoor track season is heating up, and it’s is making me anxious to start my season too. Yet again this year I’ve had the pleasure of providing news and commentary for the Evergreen Athletic Fund’s CollegeHammer.com and HSHammer.com. This season has already produced some great results that have been fun to write about. I’ve spent more time recently working on both sites and our traffic has doubled thanks in part to some great features we’ve posted on my training parter Kibwé Johson, world junior champion Walter Henning of LSU, my friend Brian Richotte, D3 record holder Kevin Becker, Norwegian champion Steffen Nerdal of Memphis, as well as emerging coaches Dave Hahn and Scott Block. As I’ve mentioned before, this past year I founded the Evergreen Athletic Fund to assist local throwers of all ages. I thought I would give you all an update on how things are progressing. With the slow economy, fundraising has also been slow. While we have found some generous donors, we are also moving forward with our broader plans. This past summer we hosted our first youth hammer throw competition with nearly every athlete recording a new personal best. We’ll be hosting another competition in early October and are also starting up a youth clinic series that will not only allow us to help youth athletes, but will also help us raise funds to meet our goals of helping elite athletes. Combine a slowing economy and a post-Olympic year and you have a recipe for struggling amateur athletes. Nike, adidas, and other shoe companies have been the traditional financial backers of elite track and field athletes. Like nearly every other sector of the economy, shoe companies have had their own share of problems recently, including layoffs. Most track and field athletes will have to wait until 2012 to return to the spotlight. With most contracts up for renewal after Beijing, track and field sponsorships have been a quick and easy way for the companies to trim costs. It’s been a while since I’ve posted, so bear with me as I have a few different topics to update everyone on. First on the agenda is a lesson in cultural literacy. While today is Veterans Day in America, it is Remembrance Day up here in Canada and other members of the Commonwealth. One interesting fact about Remembrance Day is that many people around town are wear red poppies to commemorate the day. The red poppy represents the flowers that bloomed on the battlefields in the aftermath of World War I. The poppy was used as an emblem after Canadian poet John McRae wrote about the topic. In other news, I just returned from a weekend in Seattle where I finalized the formation of a non-profit corporation. I will post more information as our plans come together, but I envision that the corporation will be used to help support local Olympic hopefuls such as myself, Will Conwell, and Aretha Thurmond, as well as other deserving athletes.